Q. Why am I not getting your emails with order confirmation, or free lessons and ideas? A. If you signed up for a free lesson and are not seeing the emails I’ve been sending to you, they might be ending up in your SPAM filter or in your Gmail “Promotions” tab. If you are using Gmail, check your “Promotions” tab. Not sure how? Watch this short video. In this video, you will also how to make sure future emails from me show up in your inbox and not in the Promotions tab. A. Most of the time, we do not have active coupon codes. So, if you have one, take advantage of it right away. If you have a coupon code and are not sure how to use it, this short video will show you how. You simply enter the coupon code into the coupon code box on the cart page or the checkout page. Then click the orange button that says, “Apply Coupon”. Q. Which Lessons are for best for me? A. If you a beginner who want to try a little carving without investing in specialized tools? Start with my Hearts and Roses. If you already know how to do the carvings in my 101 Course for Beginners, and want to start carving Thai Style Melons, lesson 11 of the Course which is Carving Watermelons – Roses, Buds and Leaves is a great primer for learning melon carving. It is available as an individual lesson. To take your melon carving skills to the next level after my 101 Course or Carving Watermelons Roses, Buds and Leaves, you’ll like my Melon Flowers – Smooth and Jagged Petals. This teaches more intermediate techniques. My Watermelon Cakes #1 and #2 lesson set is good for any level carver and is great to learn while watermelons are in season. It starts with a super easy watermelon cake. After that, you learn a cake that requires more carving. Then you progress to the 3rd cake which is an intermediate carving design. Although no other lessons are required as a prerequisite, those who have taken my Carving Watermelons Roses, Buds and Leaves lessons will put those skills to use when making the third cake. When you want something a little different after learning from my other lessons, you can get Amazing Carving with Jimmy Zhang. 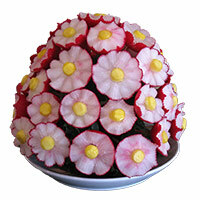 In it you will learn 3 complete centerpieces that can be done by a carver of any skill level. For a more intermediate melon carving lesson, you’ll like my Watermelon Carving Scroll Pattern lesson. I recommend the 101 Course for Beginners as a prerequisite. At the very least, you will want to take the lessons in the last week of the 101 course, which is Carving Watermelons Roses Buds and Leaves before learning the Scroll Pattern. Our most recent video lessons were made in response to many student /customer requests. Carving Letters and Words #1 and #2 will teach you how to carve words and letters that will allow you to create memorable personalized carvings. You see how to create patterns, transfer patterns, what fonts are best for carving, how to carve cursive fonts and thin fonts. Can’t decide and you want to do it all? Get my 17 Lesson Collection that includes everything I’ve listed above at a generous savings. Q. What Lessons are available in addition to the 17 lesson collection? Our newest lessons, Poinsettia Watermelon Carving, Melon Basket Weave and Star Flower Bowl are not part of the 17 Lesson Collection. A. When you order the Online courses, you get all the lessons online. When you order the DVD version, you get the DVDs and the Online lessons. 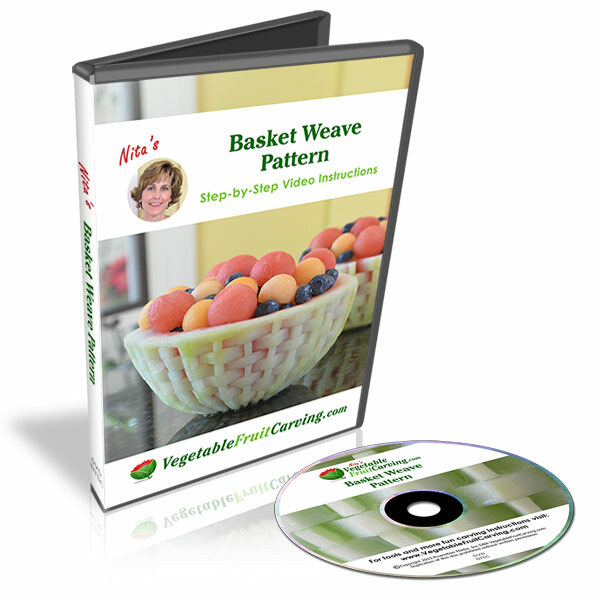 The online lessons have the exact same videos as the DVDs plus the quick print shopping lists, and links to easily get necessary tools. Because the online lessons are easier to update than the DVDS, sometimes you will find there are a few links to recipes, short added video lessons and additional photos in the online versions of the lessons. A. Some people prefer the DVDs for several reasons. A. Yes, you can watch the online lessons as many times as you want, whenever you want. Q. Will I need special tools to do the lessons? A. Yes, except in my Hearts and Roses lessons where all you need is a sharp pointed paring knife. As with any hobby or craft there are some basic fruit carving tools that will make carving easier, faster and more effective and you will have better results. When you place your lessons of choice in the cart, the tools necessary will be shown. In some cases, when you add a lesson or a course to you shopping cart, the necessary tools will be added to your cart. (When added to your cart, you may remove any tools that you already have before continuing to check out). NOTE: Fruit carving tools are quite inexpensive when you compare the cost of tools for other hobbies. You’d spent hundreds if not thousands of dollars for cake baking equipment, sewing equipment and supplies, golfing, fishing, bicycling, tennis, and many other hobbies too numerous to name. Q. What tools do I need to begin carving? A. Your questions about which tools go with which lessons are answered here. Q. How are the U-V tools in the 7 Piece Pro Tool Set Different than the Smooth U-V Cutters? A. The U and V cutters in the 7 Piece Pro Tool Set are larger, sharper and more curved than those in the Smooth U-V cutter set. If you invest in the Pro set, you probably won’t need the other set of UV cutters, although I find both sets useful. All of the tools and lessons can be found in my ONLINE SHOP. When you visit my shop, the “LEARN MORE” links will take you to pages that will give you more details on each product. Q. Which Tools are Used in Which Lessons? NOTE: you will notice that many tools are used repeatedly in many of the lessons. Once you have your basic set of 6 to 8 tools and tool sets, you will have have you need for most of the lessons. A. It’s Easy. Go to our online Shop. Click the “Add to Cart” button for any item that you would like. Once in the cart, you can add other items by looking in the section below where the item that you added to the cart is shown. Or, you can click the button that says “Continue Shopping” to return to the shop where you can add other items. Once you have all the items you would like in your cart, click the “check out” button. then fill out the form with your billing address, shipping address (if different than your billing address) and enter your payment information. We accept Visa, Mastercard, Discover and Paypal. Then click the submit button to complete your order. A. Visa, Mastercard, American Express and Discover cards. We also accept PayPal. A. No. We are not set up to accept any payment other than Visa, Mastercard, American Express, Discover card or PayPal. A. We ship all in stock DVDS and tools the next business day. Orders in the USA will take approx 3-7 business days. International orders take 3-10 weeks. Orders are shipped from Kansas. We generally ship orders the day after we receive them when the items are in stock. (We do our best to keep all items in stock at all times). A. That depends on what you order and where you want it shipped. To see the shipping amount, add the lessons and tools that you want to your cart. Once you have the items that you want in your cart click the “next” button. On the check out page, add your country or state and the shipping will adjust accordingly. You can see the shipping amount before entering your payment information. A. International orders typically take 3 to 4 weeks. They can take up to 10 weeks. Often, orders arrive sooner. (When you order lessons, you will be able to start learning by viewing your lessons online, well before your order arrives). For payment, we accept Visa, Mastercard, Discover, American Express and PayPal. I’m sorry but we are not set up to accept bank transfers, Western Union, or pay on delivery shipments. A. The easiest way to get back to the free radish bouquet lesson is sign in for the free lesson again with your same email address that you used to sign in before. The system will recognize you and take you straight back to the free lesson. A. Go to the member log in page and click where it says “Members Log in Here” near the upper right of the page. Then click on “Lost Your Password”. Then you can enter your username or email address and you will receive a link via email to create a new password. A. When you complete your order, you will receive an email confirming your registration that contains your user name, password and the link to the member log in page. If you don’t see the email, check your SPAM folder and/or your “Promotions” tab if you use gmail. the email might end up there. If you still do not receive an email, contact us and will we straighten it out for you. Q. How do I transfer a portrait photo to the pumpkin or melon? A. You will learn how in the Portrait Carving Course. 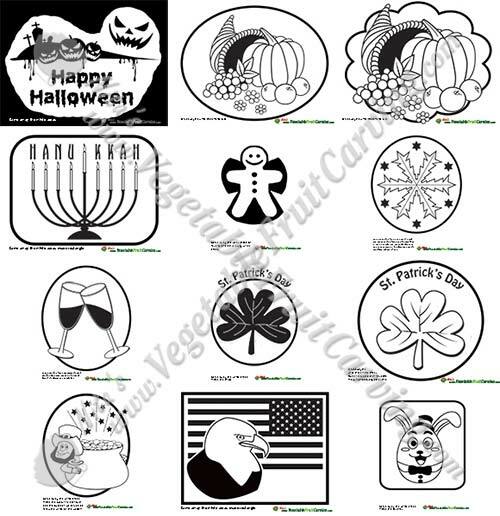 I find the Transfer Pattern Paper to be the fastest, easiest, most accurate way to transfer carving patterns of any kind to watermelons and pumpkins. However, I teach 4 other methods in my Portrait Carving Course. In my Portrait Carving Course, I go into details about how to choose a photo or shoot a photo that will make a good pattern. If you shoot a photo, you can use any camera including an iPhone. You will need a computer to make your pattern and a printer to print it. Q. How do I learn to carve portraits on watermelons? A. the techniques taught in the Pumpkin Portrait Course apply to making watermelon portraits. The Watermelon Portrait lesson will teach you how to apply those techniques with a few changes, to carving watermelon portraits. Q. How much do your lessons cost? A. You will find all the pricing on currently available lessons in my Online Shop. Q. Do you have a physical brick and mortar shop? If you are looking for specific carving ideas for a particular event of competition, you may use by blog as a resource. Here is a link where you can go to learn how to search my blog for idea for your event. A. We make sure the tools that we ship are in good condition before shipping. If you receive tools that you believe faulty, let us know right away. We cannot be responsible damage occurring from misuse of tools and for that reason, do not offer the same guarantee as we do on our lessons. For the Transfer Pattern Paper and the Pattern Transfer Fabric make sure you read the instructions fully before using.